Men Outfits With Loafers: Loafers have been around for the longest time, but recently they have gained some extra popularity and have become the hottest trend. The coolest part about them is their comfort, the flattering look, and their versatility. The various options and style are available for men that make a perfect style statement and give a completely fresh and modern look. From celebrities to ordinary people, men and women, everyone is jumping on to this trend. If you are new to this style and are unsure about where, when and how to wear your favorite pair of loafers, read on because this post covers it all, deciding which outfits do or do not go with loafers can be a little tricky, but once you get it right the look is totally amazing. A few things you need to keep in mind when selecting loafers and the outfits to be worn with them are the overall looks, trouser cut and length, loafers quality and the trouser-shoe gap. For further assistance, we have compiled different outfits with loafers for all you confused men out there! 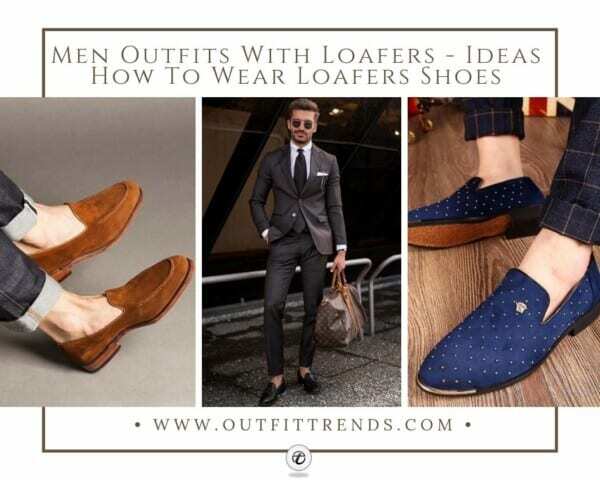 So have a look at our 30 ideas on how to wear loafer shoes! How To Style Loafer Shoes? In casual settings, the loafers are the ultimate go-to footwear. Put your best foot forward by pairing them with some khakis, shorts or casual jeans. While most loafers are typically worn without the socks. You can go for the no show socks. You can add them to your formal style by going for the classy, leather ones. The tassel detailing can be an added point. While for your everyday style we would recommend the suede loafers that can be paired with almost every style. Do not wear casual loafers to formal settings. It can be a style turn-off. Explore with different colors and details to make the right style statement. If you are going out running errands, meeting a couple of friends or just casually hanging out you can simply wear your favorite loafers casually with any tee and jeans. To pair them with your worn out jeans, pick out colors that stand out. For example, tan, brown and white are great colors to wear with your casual denim jeans. Just putting a slight effort in your outfit makes a lot of difference. Simple detailing such as color coordinating your loafers with pants or shirt will completely transform your look. We bet you had not seen this easy trick before. The blue on blue looks extremely elegant with the black jacket. Also, check out [Top 10 Men Formal Shoes Styles And Ideas How to Wear them. Button down shirts are just as famous as round neck tees. If you are fond of the former, we recommend giving it a fun look by opting for the loafers. This blue and white attire has perfectly been complemented with some brown loafers to tone it down. We also love how well they look with the folded pant. If you are going for a casual style like this one, make sure to ditch the socks to keep it cool. Who says you can not wear loafers to weddings? You can totally rock them with a formal shirt and bow tie. It is important to keep in mind what kind of pants you are wearing with loafers. These slim fit pants paired with loafers give an amazing modern look. You don’t want your pants hanging over your loafers and destroying the whole look. A cool way to stop that from happening is to fold up your jeans. It will make your loafers stand out and also give a very stylish look. Loafers look absolutely stunning with shorts and attract a lot of attention so if you need to show off your new pair of loafers, this outfit is for you! With loafers, there are no rules when it comes to socks. You can totally go without socks whenever you want and look fashionable at the same time. Not only that, but you will also stay comfortable all day. College boys tend to pay extra attention to their outfits to look their best. A great way to look trendy and dapper is to keep the outfit light yet classy. This casual outfit with a checked shirt and folded pant is the way to go. Add in a brown or beige backpack, some arm accessories and classy footwear to complete the look. If you are tired of sneakers and want to ditch them for something better, loafers are the answer. Here is a gorgeous look for all black men out there. This casual, light-toned outfit is something you could sport to a coffee date or while at College. With a light colored outfit like this, it is essential to keep the footwear classy. These dark brown leather loafers complement the camel shirt well. Winters are your time to shine given the endless fashion options. One way to do a cute and youthful style is to go for a layered look by wearing a round-neck sweater over a collared shirt. This timeless classic never seems to go out of fashion and is much loved by boys and girls alike. For a casual appearance like this one, you can add in some comfortable slip-on shoes like these loafers to finish it off with perfection. You can never go wrong with a three-piece suit, that too in such an elegant color. This dark brown suit paired with black accessories is the ultimate gentleman look. Keep up with all the latest trends by replicating this formal look at a work meeting or wedding. Do not forget to go for some black loafers with tassel detailing to match the look. It might just turn out to be one of your best look of all times. When going to any formal event, you can wear a coat and tie with a pair of classy leather loafers. We assure you that you will make all heads turn your way! This bright and funky tie seems to be working well in turning this elegant look into one quirky style. This outfit is great for all daytime appearances and weddings. If you are replicating this look, do not forget the cool sunglasses and a brown watch to go with the belt and loafers. Animal skin shoes are the latest trend in the footwear industry. We are super impressed by these textured brown shoes. You can add these to your outfit for a timeless and formal style. You can wear these brown loafers under a classic black suit. Some Winter essentials that you should stock up on include a nice overcoat, a jacket, and a sweater. Put these together with a pair of leather loafers to take your style game up a level. Hey, guess what? You can wear loafers to the beach too! Instead of going for the same old black and brown ones, choose something funky and bright such as this blue pair with cute shorts. You will surely receive a lot of compliments! As said earlier, you do not have to follow a specific rule when it comes to loafers. You can wear them with socks in winters or if you feel like wearing it otherwise. Create a youthful and comfortable look by wearing these loafers under a round neck sweater and a pair of jeans. How hot do these tassel cool loafers look? You should totally wear one of these for a unique and classy look when going for any professional work. The perfect outfit with these would be a semi-formal collared shirt with a coat. This look will surely impress everyone around you. Loafers can also be added to any formal suit to create a sophisticated and smart look. If you are invited to a wedding and want to make a timeless appearance, we totally recommend this gray look. Keep it light and minimalistic by going tie free. We encourage loafers to be worn with a slim fit, and well-tailored pants. These gray pants look classic with this light blue colored shirt. The dark brown loafers keep up with the style quotient, without taking much away from the outfit. The brown helps balance the colors out, giving a very clean look. You can wear such loafers at your workplace or while out with friends. Tired of the same look? Well, your loafers can make all the difference. Instead of going for neutrals and dark colors, go for something bright and funky such as this bright yellow pair of loafers. It is perfect for a fresh look. Wear it with a simple white shirt to balance out the look. Light-colored pants will really enhance how your loafers look and brighten them up. For that, you can wear white or any other light-colored pants with any shirt and loafers of your choice. Shoes are an important part of any outfit. They can totally make or break your look. We bet you have never spotted better-looking shoes than these. The lace detailing on these gray loafers is to die for! We love how these neutral colored shoes work well with a similar colored outfit. Rock this outfit during daytime for an uber cool and minimalistic appearance. The casual style of these loafers is best to be worn without socks. Loafers look amazing with denim outfits. You can go for a denim jacket, shirt or jeans. The best kind of loafers to be paired with this outfit would be classy blue colored. Let your outfit be an expression of your inner self. Put together a classy and gentleman attire with a few basic wardrobe staples. Replicate this dapper style by adding in a dark aubergine colored suit jacket over denim jeans. The warm-toned sweater and socks make the tan loafers look exceptionally attractive. Transform your everyday style with this polished and fanciful look. Go for an effortless look this Winter season by adding in an overcoat to your attire. Black is the new black and will remain a timeless color. The black shoes have been added to keep up with the overall dark theme. Though we suggest adding in different colored loafers to neutralize the look. Accessorizing your outfit in the winters becomes a fun and easy task. There are so many options available and you finally get to take a break from the boring ties. Mufflers and Jackets can easily uplift a boring outfit, giving you a classy look. While not entirely formal, we love the idea of adding in a pocket square to your jacket. The color of the Loafers has been picked, keeping in mind the color of the muffler and pocket square. Overall, the three outfit essentials look super classy when put together. Smart casual is the way to go for an elegant style. You can wear it to informal meetings, a special date or any occasion where you would want to make a style statement. Smart casual is far from business casual as you are allowed to go a bit more comfortable on the fashion level. You can do that by adding in a basic shirt under your suit jacket along with some casual footwear. For the shoes, we totally love the loafers look that goes well with the folded hem of the pant. On a hot sunny day, wear brown loafers with a white shirt and brown shorts. To further enhance the look you can wear a hat and go all retro. Oh and don’t forget your shades! These classic slip-on shoes can also be worn to a Summer vacation somewhere in Europe. We absolutely love the classy yet comfortable look that you can achieve in this simple way. Wow Amazing! it is really good article and pictures of loafers shoes.